82 High St,CR3 5UD.Tel: 01883 344140. 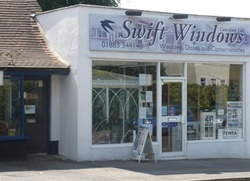 Swift Windows for windows, doors and conservatories at attractive local prices. Friendly - no pressure service -at affordable prices. We also offer soffit, fascia etc and bifolding doors. 70% of our work comes from recommendations.